Former NRL player Jarryd Hayne is set to return for the San Francisco 49ers, after he was promoted to the NFL franchise’s active roster ahead of tomorrow’s match against the Detroit Lions. Hayne played six games early in his debut NFL season before being waived by the team on October 31 after dropping three punts as punt returner. He signed to the struggling franchise’s practice squad on November 2nd. The 49ers announced this morning they had placed tackle Alex Boone on the Injured Reserve List, and promoted Hayne from the practice squad to their 53-man active roster. Former Parramatta Eels star Hayne travelled with the 49ers squad to Detroit, prompting speculation he would be promoted for the game. 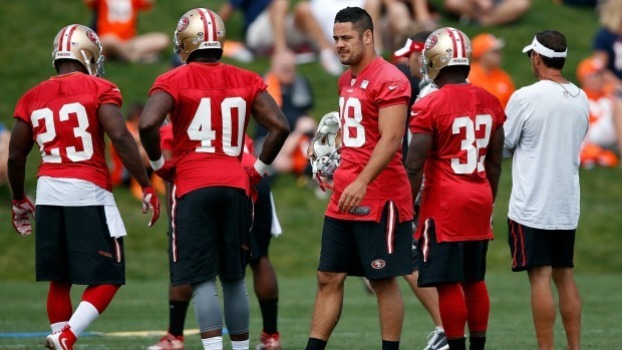 Hayne’s return to the 49ers’ 53-man squad doesn’t ensure he will play the Lions. The 49ers can only take 46 players into each game, so Hayne will have to survive another cut, which is announced 45 minutes before kickoff.